Restoring hope to former street youth and vulnerable children in Kenya. A quick update on the new girls’ dormitory – the construction has been going according to plan and everyone is very excited about the progress. All that is left is to paint the dormitory and install electricity! The Move-In Day is still as scheduled July 20th; look out for more updates on this huge project soon. Today we had what I believe is a microcosm of Arrive, and it came to us in the most unlikely form. Last year the average American used 167 disposable water bottles and only recycled 38 (https://www.banthebottle.net/bottled-water-facts/). The bottles that are not recycled pollute the environment and virtually never break down. As Fran (an Arrive volunteer from Australia) and I were drinking coffee a few mornings ago, we discussed Arrive’s use of disposable bottled water and how destructive the bottles are to our earth. Fran had an idea – Arrive should buy each child a reusable plastic water bottle! Fran donated $100 online; Arrive bought 50 Nalgene-sized (1,000 liter) water bottles for $2.00 each. Volunteers routinely come with their Nalgene or Hydro Flask bottles, and now the kids have their own bottles too. Each child now has an opportunity to stay hydrated with his/her own water bottle. Each child has been given knowledge about the issue of pollution of plastic water bottles as a local issue (keeping our home and compound clean) and global issue. Each child understands the importance of sustainability and how a re-usable water bottle helps to reduce the number of disposable bottles we use. Our children are now role models for the rest of the community as we create sustainable habits and practices. Nurturing pride and caring in the kids’ own possessions by giving them a bottle. Because of the bottles’ material, the children have the ability to carry a variety of drinks - cold liquids or hot liquids (chai tea every morning going to school), which they could not do with the disposable bottles. We are reducing trash and waste as an organization and as individuals; we are keeping our environment clean. The bottles are re-usable, representing a long-term solution to reducing our dependence on disposable bottles. Why is this small $100 project a microcosm for Arrive? Just look at the bolded word from each bullet point above: opportunity, knowledge, sustainability, role models, pride, variety, clean, and long-term. These might be buzz words to some people however they are absolutely applicable to this project – one which has given us a tangible solution to a relevant issue for only $2.00 per child. Arrive is thrilled to introduce our new solar solutions at the Light Home of Hope and Light School in Uriri, Kenya! This $4,992.88 project was no easy task, and thanks to the hard work of fundraising Julia - pictured in Uriri on the right, current student at Boston College and currently volunteering in Kenya with Arrive - we have been taken out of the dark. The outcome of a successful solar power project in rural Kenya is provides exponentially more tangible impact than a solar power project in a first world country. The solar panels and batteries, which have been integrated with our electrical grid of Light Home of Hope, power both our childrens home (both dormitories, study room, volunteer headquarters, main house, and more) and the entire Light School and its 423 students! The solar project adds 45 days to each year per person; read below to find out how! As part of constructing a happy and holistic environment for the Arrive children, environmental sustainability is a central goal and must be incorporated into the home. In rural Kenya, although receiving 12 hours of sunlight daily, costly and unreliable power make studying hard with no proper lighting at night. By taking advantage of our position on the equator and adding a solar power system consisting of panels and batteries, we've increased our environmental sustainability, financial sustainability, and quality of life of the children we serve. To understand the potential of a reliable, renewable, and efficient source of energy, the typical day for a student in rural, sub-Saharan Africa must be examined. The suns rises at 7:00am sets at 7:00pm every day of the year in rural Kenya, an area in which electricity is rare and when connected is unreliable. Kenya’s location on the equator provides the country with much sun, a steadfast 7:00pm sunset, and opportunities to utilize solar power. The “active” hours of the day, meaning the hours during which the sun is up and work can be done without the need of artificial light, are 6:00am – 8:00pm. This includes one hour of dawn before sunrise and one of hour of dusk after sunset. During these 14 hours, nearly every job of the day must be completed: teachers teach with no light bulbs in the room; students are able to study without using any electricity; farmers tend their crops; construction workers build. In rural Kenya, day jobs are followed by chores: washing clothes; fetching clean water; collecting firewood; tending to livestock; building then cooking over a fire. In most households, the responsibility is left to the kid(s) to carry out a majority, if not all, of these chores before s/he leaves for school in the morning and after s/he returns home from school in the evening. It is common practice for children to start chores at a very young age. If parents fall ill with HIV/AIDS, or if a large family lacks resources, students often times are taken out school to instead complete these chores for the family. For students who remain in school and return to their homes by 5:00pm, there are only 3 hours before 8:00pm. Unable to see, focusing on homework and school assignments is near impossible until the following morning. Without electricity, these “dormant” hours are 8:00pm – 6:00am (10 total hours). Most rural homes in Kenya do not have electricity. For the lucky families and institutions (like us) who can afford the relative luxury, it is often unreliable with frequent blackouts. The poorest families do not have enough money for candles or matches; for 10 hours everyday, they are literally in the dark. Adding a solar energy system to the Light Home of Hope has, based on a conservative estimate, increase each student’s “active” hours by 1 hour in the morning (5:00am – 6:00am) and 2 hours at night (8:00pm – 10:00pm). The 3-hour (21.4%) increase provides our dedicated students an extra 21 hours every week to read, write, study, learn, and be engaged. Solar panels securely mounted on the home’s roof will collect sunlight all day. Batteries inside the home store the energy and are connected to the main power system on the Light Uriri campus. From 6:00am – 8:00pm, no solar power is needed as natural sunlight is sufficient. From 5:00am – 6:00am and 8:00pm – 10:00pm daily, the stored energy can be used to light rooms and outdoor areas. Solar energy will provide the children with 21 extra hours of light per week – the equivalent of nearly one full extra day, every single week. Each child who lives at Light Home of Hope may receive up to 1,095 hours (equivalent to over 45 days) of light every year, unless s/he sleeps late on the weekends! The solar energy system also connects to the Light School to provide the 423 students with better-lit classrooms before school. For students who use the time after school but before sunset to complete chores, 5:00am – 6:00am before school is their hour of opportunity to accomplish schoolwork from the previous day or receive much-needed tutoring. This opportunity comes by way of a well-lit classroom available to students and teachers before school. With a reliable source of power, the students won’t have to worry about having enough hours of sunlight to finish on their homework – light will be guaranteed everyday. Solar power fights against global warming by reducing greenhouse gas emissions from traditional fossil fuels like coal. On top of solar energy’s environmental benefits, Arrive would no longer need to pay for an unreliable, expensive source of electricity to light the home at night. The solar energy will decrease our carbon footprint and our electricity bill. Our solar energy project at Light Home of Hope will demonstrate the importance, to young boys of girls of rural Africa, of a sustainable, efficient, and renewable source of energy. Encouraged to explore the countless benefits offered by other sustainable projects, those children will grow up to one-day help provide renewable energy to the 634 million people (worldenergyoutlook.org) in sub-Saharan Africa who currently lack electricity – literally taking them out into the light. As they should be and usually are, Arrive blog posts are about Arrive and our life-changing, tangible influence in the lives of the most vulnerable children throughout Kenya. However occasionally I like to give you an inside view into my life in rural Africa. Life here has become so normal for me that sometimes I forget that my path, from a well-off, preppy, all white Connecticut suburb to a small village in rural Kenya, is one full of hilarity, new cultural experiences, and adventure; a unlikely path worth detailing from time to time. There is so much exciting news at Arrive that it deserves its own post. I could tell you about the new girls’ dormitory progress and how much we have completed…but I’ll save that until closer to the “Move-In Day” (July 20th 2017). I could tell you about the $4,933.03 solar solutions project which will provide the entire Light Home of Hope with renewable energy, lessen our dependency on the unreliable government electricity, decrease our monthly operating costs, and reduce our carbon footprint…but I’ll save that until closer to the “Installation Day” (June 10th 2017). I could tell you about how all the kids are thriving in school, or how we are expecting over 20 volunteers from around the world over the next few months…but I will wait until they Arrive (pun intended). Instead, this blog post will be snapshot into a few light-hearted experiences in the past few weeks of life in a rural Kenyan village. Living in a 3rd world developing country, I routinely see atrocities, human rights violations, extreme cycles of poverty and hopelessness, and death on a near daily basis. These are the battles, our battles, to fight and win. However, to stay sane in our crazy world, I remember this quote by Paulo Coelho: The simple things are also the most extraordinary things, and only the wise can see them. A fantastic find at the outdoor market - I grabbed this second-hand hoodie for $1.50. It had been donated, shipped to Kenya, then sewn with traditional East African fabrics. The best part? It is authentic Bass Pro Shop! One of my most proud moments came when Arrive was featured in National Geographic (yes…that National Geographic). Read the awesome article here: When Kids Learn to Raise Bees, the Future Gets Sweeter. I have courageously (if I do say so myself) explored the more “interesting” of the local cuisine – from drinking cows’ blood fresh after the slaughter, to eating an entire boiled goat’s hoof (fur, skin, tendons, and all). This week, I tried a local delicacy, freshly fried termites - surprisingly savory and crunchy! Shaggy (one of my dogs) gave birth to seven healthy puppies! We thought she would give birth earlier this week, so one of the kids and I prepared her kennel with with blankets and an old mattress. We kept her inside there for the past few days because we knew she would give birth anytime, and that's where we wanted it to happen (instead of her favorite place at home, underneath my bed). Then a few evenings ago, we decided to add another mattress so we let Shaggy out to fix her kennel inside. After five minutes we called her and couldn't find her! In those few minutes, she had sprinted to underneath my bed and gave birth to seven healthy and beautiful puppies! If you are aware of how much animal therapy goes on at Arrive, you'd know that these puppies will not only live happy lives, but exponentially increase the happiness of the Arrive kids as well. I invited my friend from the bush to hang out a few nights ago at my boma (“hut” in Swahili). At night, he asked if he should turn the light out to which I replied yes. He proceeded to take a stick and SMASH my light bulb, shattering it into a million shards of glass. Literally, he had never been introduced to the concept of a light switch! I am continuing to run everyday; running has been a source of consistent physical activity but also of spiritual growth and adventure. I tell people I live on the Serengetti Plateu in the land of milima na mabonde (“hills and valleys” in Swahili). There are enough paths in Uriri and the surrounding villages to meander everyday of the year and never repeat the same route – one of my lofty 2017 goals. The hills are tough and the sun is brutal, but nothing easy is truly worth doing, is it? of the Democratic Republic of the Congo to attend her friend’s wedding in Mombasa. Besides swimming in the Indian Ocean and eating coconuts off the tree, I got to dress up for the big day! Note: Ciara deserves 100% credit for my exceptional appearance, as she had a shirt sewn for from her home country of the Congo. I hope you’ve enjoyed these few stories from life in rural Kenya; between the life-chaning work of Arrive and my daily adventures, I wouldn't trade my corner of the world for anywhere else! Be sure to stay tuned for more Arrive-related posts, including progress update of our many on-going projects. Until then, the sun is beginning to set, and I need to buy a new light bulb! There are thousands of non-profit organizations out there vying for your coveted support. We know Arrive is different. But...how? Arrive believes solutions to local problems must come from local people and not from foreign agencies imposing ideas which they think will have the most beneficial results regardless of the actual situation and needs on-the-ground. Instead of the traditional yet highly flawed neo-colonial method of international aid, Arrive promotes locally driven initiatives carried out by members of the society in which we work. We partner directly with local non-profit organizations around the world - engaging and empowering native community leaders to provide aid for the most vulnerable kids of their society, while promoting engagement in economically progressive and sustainable projects. Socio-economic development in Kenya must be propelled by Kenyans themselves, ensuring Arrive’s model for aid is sustainable and delivers long-term, highly effective progress. Along with our partners and donors from around the world, Arrive is devoted to the rescue of homeless street children and starving orphans, providing them with hope and the tools to create a happy and self-sufficient life in the society that once abandoned them. We are passionate about encouraging sustainable practices and building infrastructure that will provide long-term assistance to those who truly need it most. This is clearly visible in the vast past and on-going successful Arrive projects, which have yielded tangible, long-lasting, and progressive results. A nearly perfect example of the above is our brand new joint project with local Kenyan-based non-profit Light Uriri. We are excited to announce that we have begun the initial construction stages on our new Light Home of Hope Girls' Dormitory! Why would we need a girls' dormitory, you ask? Remember Sharlene, from the previous blog post. We are building this dormitory for Sharlene (who is thriving here at home, by the way) and the countless other girls who share her struggles throughout Kenya. The first construction stages of our BRAND NEW girls' dormitory are officially underway! This home will be a place of refuge for young orphaned and homeless girls, escaping FGM (female genitalia mutilation) and the cycle of poverty. Check out below for some pictures of the progress, and stay tuned for more updates soon! Who remembers Fred? If you may have forgotten his story, check out his compelling tale that was a major input in the formation of Arrive In Kenya; just click here. Well, five years later, Fred has successfully graduated from Arrive's complete rehabilitation program! We could not be prouder of Fred that after years of school, obtaining his Kenyan identification, graduating driving school and receiving his drivers license, Fred at 18 years of age was ready to return to his home after a full 11 years of being away. His relatives thought he had died in 2007 and were beyond excited to see a full-grown and matured Fred walk confidently back into his family's land; a giant smile from ear to ear. Fred's successful graduation meant an one open opportunity for one of the hundreds of thousands street children in Kenya to create for him or herself a better life at the Light Home of Hope in Uriri. Victor, the Light Uriri Home Manager, and I set out to find the next vulnerable and deserving young boy or girl. We first visited Machakos, the center of the Kamba tribe. We then moved onto Nairobi, where we were met with hundreds of children begging to accompany us back home. Side Note: Being surrounded by street kids has been a common occurrence for me in Kenya, but this time was the first in which they tried to rob me. I was wearing a drawstring backpack which was virtually impossible to steal from. As it was hanging off my back, an older street kid slashed the bag with a razor blade, ripping the material in an effort to grab what was inside and run away. Fortunately I felt the theft attempt and was able to salvage all of my belongings with nothing being stolen. Victor and I roamed the streets well into the night and after talking to countless street kids, we identified one young child - a street girl named Sharlene. Sharlene was born in the street to a mother who lived in the streets of Kawangware, a Nairobi slum. After her mother died, Sharlene continued to survive in the streets, using toxic glue as a vice to get through the day. Being a street girl is even harder than being a street boy; the abuse she endured is unimaginable. Sharlene desperately wanted to go to school and we decided to give her that opportunity. It was with great pleasure that Sharlene came back to Uriri with us to begin her new life as a student; to re-create a childhood that she missed out on; to enter the same society that once abandoned her and left her alone to fend for herself. After a quick visit to the doctors office, Sharlene was cleared to join her new brothers and sisters at the Light Home of Hope. It has been only a few days since Sharlene has come home, but her attitude has changed dramatically. She is happy, smiling, and for the first time in what I would imagine is many years, hopeful. Hopeful of a bright future, thanks to your support of Arrive and our mission. We'll keep you updated on Fred's new life outside of our home and Sharlene's new life inside, but for now, a picture speaks a thousand words. Sharlene is in the white jumper, next to me, at the Light Home of Hope in Uriri, Kenya. My name is Brian Ash. I’m 26 years old, from Ridgefield, Connecticut, USA. In 2008 I rode my bicycle 3,080 miles westward across the United States of America, only stopping when the Pacific Ocean forced me to. In 2012 I climbed to the highest point on the continent of Africa – the summit of Mt. Kilimanjaro – because its there. For the past three years I have lived in a small village in rural western Kenya foregoing most of the amenities which the developed world has come to take for granted. Now, in 2017, I will face the hardest four (maybe five…or six) hours of my life - I am attempting to conquer 26.2 miles and complete my first marathon in support of www.ArriveKenya.org. I despise running more than waking up too early in the morning. It hurts. I’m slow. My dislike for running is strong, but my love for Arrive and our kids is stronger. I am willing to put my body through absolute hell and back just for the chance of giving these kids what every child deserves – happiness. Am I scared? Absolutely, but I am ready to face my fears on March 18th, in a small village west of Eldoret, Kenya. What waits for me there are 26.2 punishing miles ( http://riftvalleymarathon.com) through some of Kenya’s most beautiful but toughest terrain in the heart of the Great Rift Valley (yes, the Great Rift Valley), reaching a staggering 7,000 feet above sea level. But first, what is Arrive you ask…? 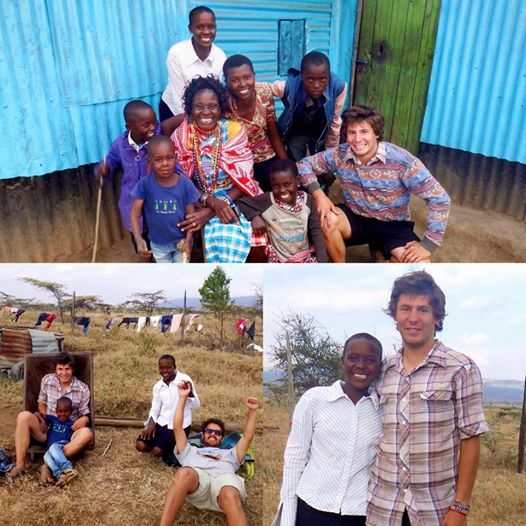 After graduating from the University of Colorado Boulder in 2013 with a bachelor’s degree in Economics and with the support of my family and friends, I founded an amazing non-profit organization – Arrive ( www.ArriveKenya.org). Instead of the traditional yet highly flawed neo-colonial method of international aid, Arrive promotes locally driven initiatives carried out by members of the society in which we work. We partner directly with local non-profit organizations around the world, engaging and empowering native community leaders to provide aid for the most vulnerable kids of their society. Social development in Kenya must be propelled by Kenyans themselves, ensuring Arrive’s model for aid is sustainable and delivers long-term, highly effective progress. Arrive is devoted to the rescue of homeless street children and starving orphans, providing them with hope and the tools to create a happy and self-sufficient life in the society that once abandoned them. We are passionate about encouraging sustainable practices and building infrastructure that will provide long-term assistance to those who need it most. Now, I am ready to push myself to the limit, both physically and mentally, to support the people and organization I love. I anticipate my training to be painful. I know my runs will be grueling. What is truly grueling, however, are the lives that street kids in Kenya are forced to live. Living in dumpsters and under cars, sniffing toxic glue to mask their hunger and sadness, all by the age of ten. I am inspired by these children who never give up and I will think about their resilience as I motivate myself to put one foot in front of the other, over and over and over again. As I begin my journey, I encourage you to get involved. I am raising money for Arrive so we can further extend our positive impact in the developing world. Of course, I’ll be paying for all expenses of the marathon myself; every penny donated will be given directly to Arrive to support the kids. 100% of our donations will go towards buying desperately needed foods, clothes, and school supplies for the boys and girls of our childrens home. Joining my quest for 26.2 miles not only means the world to me, but also may be the difference between the streets and our home, desperation and happiness, life and death, for a young child in Kenya. I aim to raise $2,620 – first as a tribute to the 26.2 miles I look to complete in March and secondly because I thought $26,200,000 to be a bit ambitious. Every dollar you donate, including any extra funds that are raised above the $2,620 goal, will be deposited directly into the Arrive bank account (see the "Certified Campign" on the right). Supporting Arrive by contributing $1 for every mile I run is equivalent to a $26.20 charitable donation. Follow every step of my journey on Instagram: @brianrunsamarathon (or click here: http://goo.gl/uwD6oV), to see photographs and statistics from each of my training runs around the world. Asante Sana (‘Thank You Very Much’ in Swahili) to everyone who supports my personal journey and the mission of Arrive. Your continued and gracious support has enabled us to create positive change around the globe - your donations are truly making the world a better place. Kuwashukuru ('Special Thanks') to my aunt Vicki for expertly coaching me through all of my training; to my friend and Arrive Board Member Davide for always creating a way to motivate me to keep running; and to Boulder Running Co. (Boulder, Colorado, USA) and Ridgefield Running Co. (Ridgefield, Connecticut, USA) for hooking me up with only the best gear. Hongera! On Wednesday last werk I returned to Kenya. I was proud of the training and progress I saw in my running during my stay in the United States over the past two months, but that feeling of accomplishment turned to horror about a mile into my first run in Africa. The air is thinner, the sun is stronger, the hills are longer (and steeper), the dust is thicker, and the roads are…well…barely roads. I feel like I am beginning my marathon training all over again, only three months until the big race. - Instead of running by myself, I now have a team of Arrive kids who not only run with me, but love leave me in the dust. I love it. - Meet Siaya (pictured below), 14 years old. He came with us on a run last week. He showed up to run with us in the only clothes and shoes he has. About 10 minutes into our run, his sandals ripped in half. He wore the sandals on his hands for the next many miles, running barefoot on the rocky trail. We reached a 20 yard stretch where a few glass bottles had been shattered and there was broken glass on the ground. Siaya powered through in his bare feet and continued running. In total, Siaya ran with us for 4.5 miles, averaging under 9 minutes per mile, in jeans, barefoot. And he beat me. I would love to purchase Siaya a pair of shorts actual running shoes; please contact me for more information if you wish to help Siaya. - On another run through the outskirts of the village Uriri, we ran past a young girl with a shopping bag in each hand; she had just come from the village center to buy food for her family. She decided to run with us all the way back to her home (pictured below) It was awesome! - Unanticipated training: having to squat with very sore legs in the latrine to do my business. Let’s just say, my mile isn’t the only activity where my pace has quickened! - Everyone is so supportive during my runs here as compared to in America. A wave, word of encouragement, or smile is received from nearly everyone I run past. The Rift Valley Marathon also offers 4-person relay. I knew Kenyans are skilled runners but the boys and girls here have impressed me beyond my wildest expectations. I would love for the Arrive children who enjoy running and who are dedicated to transforming themselves into better runners, the opportunity to compete in the race. - Buy all of the deserving runners a pair of actual running shoes. - Pay for race fees and transport for the deserving runners. - Increase the amount of food we give the children at Light Home of Hope; if the children will be burning more calories for the next three months, we need to ensure that they continue to eat a sufficient, healthy, and well-balanced diet. Thank you all again. Many of you have asked if you can donate slightly used running shoes - unfortunately we cannot accept packages. The customs fees are astronomical even for us and paying hundreds of dollars to accept the package is not economical. We will gladly accept donations to help the Arrive runners obtain the gear they need. Donations specified for children’s running equipment will be used in that manner. It has been a tough few weeks training in Kenya. The Kenyans who I run with are younger than me, faster, run effortlessly, an have more fun than I do. Instead of this motivating me to run harder, it demoralizes me and makes me want to give up. I am still adjusting to running here - besides the insane hills, burning heat, and high elevation, I generally have two options. Option 1 - Run on the main roads and endure clouds of thick black smoke coming from trucks (there are no exhaust emissions testings here) as they pass going way to fast just inches from my face. Option 2 - Run on backcountry roads and endure a dust storms that don't just make it impossible to breathe, but blind me indefinitely as I not only try to continue running but also avoid the random 6-foot deep holes that happen to be in the middle of the trail. I don't know what I am going to do, and I have 1 1/2 months before the big race day to figure it out. Oh, did I mention that I have made the news in Kenya? https://www.standardmedia.co.ke/lifestyle/article/2001227805/marathon-driven-by-love-for-kids. NO PRESSURE...!! My race did not go as planned. I am excited about the $5,160 we, together, raised for the Arrive kids. My campaign closes on Friday; please share this ling with any last-minute supporters (goo.gl/wpGs3R). I am grateful for the humbling race experience. I am dissapointed with my race result (I was however the fastet American finisher...out of 3). I was neither mentally nor physically strong enough to run the whole race, and had to walk at times. I am motivated to train harder (starting when I can walk again). I am excited to race again in August in the Maasai Mara Marathon. The biggest thank you of all goes to the random 7 village kids, between 8 and 12 years old, who were hanging out on the race route. As I passed they decided to run (barefoot of course) with me from miles 16.1 to 26.2. I was far behind the pace of the leaders (2:10ish at 7,000+ ft elevation) and by the time I reached the water stations at 30km, 35km, and 40km, the crews had packed up and left. No water. Multiple times, those kids ran ahead into valleys to collect river water to bring back to me. Without them the race officials would still be searching for my shriveled up dehydrated body somewhere in the bush of rural Kenya. Here is a post-race picture of 4 of those kids. In Swahili, sukuma means "to push forward" - which is exactly what we have been doing, sukuma-ing, through these hot winter months in Kenya. Yup, below the equator, we've seen the winter temperatures drop from "scorching hot" to "very hot." On a more serious note, pole sana ('I'm very sorry' in Swahili) for my absence on Arrive's blog. So much has been happening here that it is difficult to reserve a few hours to check in from time to time. To start, everyone and everything here on-the-ground is absolutely superb. The Arrive kids are back in school after their mid-term break - most having returned to Light School Uriri, while the sponsored secondary students returned to their respective schools and a few of the older boys returned to Uriri Polytechnic for motor vehicle mechanical training. The return of long school days gave my friend Victor and I an opportunity to go on an adventure. According to CNN Travel, Maasai Mara National Reserve is ranked the best safari park in the world; people pay thousands of dollars and travel from around the world to visit our backyard. Victor and I hopped on our motorbikes in the morning and traveled, via backroads, straight to the Oloololo Gate of Maasai Mara. The two hour ride took us on dirt trails past women carrying buckets of water on their heads, herds of zebra, and the occasional giraffe or two. Adventures like these remind me how lucky I am to live between the second largest lake in the world and the best safari park in the world, doing work which I love and is rewarding beyond words. Our Maasai adventures did not stop at the Reserve, though. Volunteer Federico (yes, the same Federico who in 2014 dropped his iPhone down the latrine) and I went even further "into the bush" to the rural homeland of Debroah. You all know Deborah from many previous blog posts and are aware we sponsor her to attend boarding school. I check-up from time to time to see how she is doing; these excursions are both exciting and essential to Arrive's success. We were welcomed by Deborah's grandmother and extended family and slept in their manyata (traditional Maasai home, made from sticks and mud). While we only stayed one night there, the conclusion of my report is that Deborah is thriving in school, couldn't be happier, and Arrive's assistance has truly saved her life. However, not all updates are accompanied by a smile. It is with profound sadness that I announce that one of the Arrive kids has contracted HIV and is now HIV+. In respect for this particular child's privacy, I will not say his/her name or how the virus was contracted; in a country (Kenya) with the 13th highest HIV/AIDS prevalence rate in the world, there are various ways the virus may be contracted. What I can say, though, is that HIV/AIDS is a very serious and fatal virus; the Light Uriri and Arrive team have done and are continuing to follow every measure (hospital visits, counseling, medicine, etc.) to make sure this child not only lives life to the fullest, but also is not stigmatized due to the virus. Speaking of the seriousness of HIV/AIDS, last week I attended a funeral of a young girl in the village who passed away from the virus. Here in Kenya, funerals are orchestrated a bit differently - it is a multi-day affair that extends into the wee hours of the night. At 11:00pm, with music blaring from her home, we decided to cross the trail to the boma ('hut') of the deceased and pay our respects. Unfortunately, a lake came out of nowhere (I swear!) and I happened to fall into to. Our journey continued and once we arrived, we were greeted by mourners...and a live band! A village woman graciously shared with me her bottle of moonshine as she continued dancing. We were brought to the open casket of the girl, aged 12, to pay our respects and be led in prayer over her body. When we departed at 1:00am to return home, there were no signs of the live band winding down or the mourners returning home. Whether it is the beauty of the people and their surroundings, the overall happiness and sense of community, or something else entirely, I always find it extremely difficult to leave Kenya. However, that is exactly what I have decided to do later this month. In late September, I will return to the USA on a three-month fundraising tour which will take me to Connecticut/New York, Colorado, California, and everywhere in between. Please, if you would like to support Arrive in any way, watch this short video and contact me personally at brian@arrivekenya.org. Whether it is organizing a fundraiser or dinner party, or even if you would like to grab coffee, please shoot me an email! Your ongoing support is always appreciated and the impact you are making on these kids' lives is undeniable. Nearly everyday, we get requests from parents who cannot feed their families and orphaned children out of school begging to live with us. I'd like to share one of those requests with you. After writing us a letter requesting aid (seen below), we invited Billy to meet us in person. We then confirmed the truth of his story by obtaining old school records, birth certificates, and death certificates. During his meeting with us and again in the video below, he broke into tears as he explained the challenges of his childhood. I beg that you give Billy five minutes of your time and allow him to explain his own story in his own words. Click here to watch his video, to the end, and you will see for yourself why we need to help Billy reach his dreams of being a civil engineer and helping others. If you or anyone you know wants to assist this hard-working, intelligent, deserving student, please contact Arrive directly! As I return home later this month, and as you will be seeing in the upcoming months on our website and social media outlets, Arrive will be stressing the great importance of sponsorships. I won't divulge into this topic too much now, but soon we will unveil an entirely new sponsorship program aimed to better help more at-risk youth while providing Arrive long-term financial stability. Right now, Arrive is not in the financial position to be able to assist Billy. Soon, with your help, we will be. Currently at our home, we have empty beds while every night on the streets, there are children sleeping in dumpsters. Soon, with your help, they won't be. Big news from Arrive, coming soon! Over the past month, Arrive has been graced with the presence of a number of volunteers. Solomon from Ghana taught art classes to the students, Emma and Cassie from Australia aided with daily chores, and Mathew from America has just arrived (no pun intended) to begin community development projects in Uriri. But the true story of the past few weeks is not who, but where; and, thus, a tale of two migrations begins. The first migration came last Wednesday when Arrive Advisory Board Member JK cut the ribbon of the new Light Home of Hope boys’ dormitory. Consisting of a dorm, a dining hall/study room, and sanitary washrooms, the boys have now migrated from their temporary structure into their permanent dormitory. Just a few of the benefits of their new living quarters are: a more spacious and cleaner environment, resources which enable them to complete homework in a study room, entertainment on Friday and Saturday night (thanks to a new television), and the boys’ own private and secure area. All of the boys are beyond excited to finally have a true and permanent home. As the boys moved out of the temporary house, I gladly moved into the new vacant home left open. Sure, it is made from metal sheets and isn’t furnished, but to me it is paradise. For the first time in a few years, I am not living in someone else’s house – this metal shed is a place to call my own. It may not look like much to you, but Bakuu (my pup) and I are enjoying the new lot. Plus, it opens up my previous room in the Light Uriri Volunteer House for more volunteers and a more spacious living environment for our current volunteers. The second migration was one of even greater proportions. Every year, millions of wildebeests migrate from the Serengeti in Tanzania into the greener pastures of Kenya. Our partner organization, Light Uriri, organized a field trip of epic proportions for the students of Light School, and Arrive sponsored all of our kids to attend. Waking up at 3:00am, we hopped on a bus to Maasai Mara National Reserve – one of the most sought out tourist destinations in the world. I personally had been to Maasai Mara many times, but never during the famous wildebeest migration. The students, however, had never been to the park and could not believe their eyes as the bus passed by animals they had only read about in their textbooks. We saw: lions, giraffes, elephants, gazelle, zebras, warthogs, hyenas, vultures, baboons, hippos, crocodiles, buffalo, waterbucks, and of course, wildebeests. From my seat on the bus, as I looked out onto the savannah, I saw thousands upon thousands of wildebeests – they covered the horizon as far as I could see. It made me wonder if that is how the Native Americans and first cowboys saw the plains of the American west, covered in herds of buffalo, before they were killed to a point of near extinction. In my next blog post, I will address some changes to Arrive in order to bring our organization to the next level. Everyday, I see the impact that each and every one of you has made on the lives of these former street children, orphans, and vulnerable kids; thank you. In order to expand and help even more kids, stay tuned for my next post! As work continues on the new Light Home of Hope, we at the Arrive Headquarters thought it'd be wise to clarify exactly what has occurred during this exciting transitional phase. But first, a little history. In 2013, we partnered with a local Kenyan non-profit organization to create Keumbu Rehema Childrens Home to address the needs of orphaned street children in western Kenya. Over the last three years, an infrastructure was developed with the ultimate goal being Keumbu Rehema Children’s Home becoming self-sustaining. Rescued 37 of orphaned, homeless street children. Provided housing and education for these children. Built & equipped living facilities, latrines, and other infrastructure essential for improved quality of life. Provided clean, potable water through the construction of a running water system. Engaged in sustainable projects such as: utilization of livestock, use of solar power, etc. Established/expanded agricultural activities with an emphasis on teaching sustainable agriculture. Sponsored deserving students to continue their education in secondary school and polytechnic training. Used the resources of volunteers to further Arrive’s mission and goals. It has been an exciting journey with our local partners in Keumbu, watching them evolve and become self-sufficient. As local leadership demonstrated desire & ability to take on full, ongoing responsibility for the project, a mutually agreed exit strategy for Arrive was implemented, freeing our attention to move on to the next site. This is and always has been a primary tenant of our core strategy philosophy -- Arrive’s role is to help local entities to improve and expand their services to orphans, vulnerable children, and street kids; to empower our partners to a self-sustaining and managed position of strength and then move on to another location to replicate the process. Which leads us to our newest project. Light Uriri is our next qualified partner organization and the focus of our efforts for the thrust of Arrive. Together, we have established Light Home of Hope, located in Migori County, 20 minutes from the Kenya-Tanzania border and just one hour from the famous Maasai Mara Game Reserve. Although not terribly far from Keumbu, the location is geographically and ecologically VERY different so it presents some new challenges that will keep Arrive and it’s volunteers very much on their toes. It’s very exciting! Arrive will bring the successful model developed with Keumbu Rehema Childrens Home and, with collaboration of Light Uriri, begin to create another facility to rescue orphaned street children, provide education and a safe place to live. In addition, all of the children will learn skills such as caring for livestock, planting crops, computer skills, and mechanical training. We are very excited about this latest project that fits our mission of bringing positive change to impoverished regions around the world. Through our website, blog posts, photographs, videos and newsletters, we will endeavor to keep you, our supporters, informed of the progress of our newest collaboration.